For many years now, the Hugo Awards have been dominated by social justice idealogues who have given awards to subpar works just because their creator is dark skinned or has female genitalia. This is all while they ignore books that are actually enjoyable to read, because the stories don’t check the right inclusivity boxes or are written by people with the wrong political opinions. Vox Day has proven this year after year with his Rabid Puppies campaign, so there’s really no denying the bias at Worldcon at this point. But the Hugo Award has fallen to a new low with this current nomination ballot. The horrible Ghostbusters reboot, written and directed by Paul Feig and featuring an all-female cast, was nominated for the Best Dramatic Presentation – Short Form category. The inclusion of this failed abortion of a film will forever taint the Hugo ballot going forward. Before now, examples of subpar works on the Hugo ballot included such stories as Redshirts by John Scalzi, If You Were a Dinosaur, My Love by Rachel Swirsky, and almost every episode of Doctor Who. But compared to the all-female Ghostbusters reboot, those stories are deep and insightful looks into the human condition. Why I would even go as far as to say that Ghostbusters is a prime example of everything wrong with (((Hollywood))) filmmaking today. The original Ghostbusters movie made in 1984 was already fine on its own; it didn’t need to be brought back for a “modern” update. And the idea of bringing on a new cast of female characters to replace Bill Murray and Dan Aykroyd is not only a slap in the face of fans of the original movie, it is also a direct attack on our culture. The whole point of replacing the real Ghostbusters with a bunch of women is to take the beloved classic away from the fans who love it and replace it with social justice propaganda. See, the job of a Ghostbuster is really a metaphor for the sort of trades that involve skilled physical labor, such as plumbing or pest control. So putting women in these roles only serves to take them away from their natural place in the world as mothers and caregivers. (((Sony))) wants to brainwash our daughters into joining the workforce and remaining childless their whole lives, thus ensuring that the human race goes extinct and the world is overrun by wild animals. 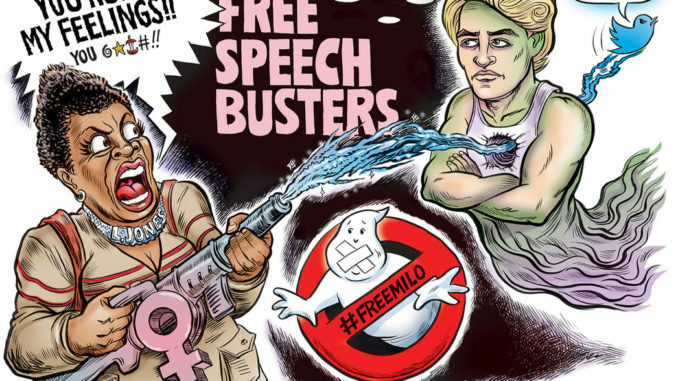 The general moviegoing public would normally reject such blatant attempts at propaganda, which is why they needed to attach their heavy handed message to a beloved film such as Ghostbusters. That was the only way they could get audiences to choke down their propaganda, for audiences would reject a new property that preached at them right out of the gate. Though it only broke even at the box office, the only reason why it made that much money was because it still had the Ghostbusters brand attached to it. The initial failure of this movie was a great victory for us in the fight against social justice to save western civilisation from the globalists! But the Left now have an opportunity to turn that victory into a defeat with the Hugo Awards. If Ghostbusters were to win the Hugo Award for Best Dramatic Presentation – Short Form, then the prestige that the award brings would encourage (((Hollywood))) to continue making these movies, even if they aren’t financially profitable. So it is for that reason that we must stop Ghostbusters from winning the Hugo Award, because a win for Ghostbusters will undo all the work that we’ve done reclaiming the film industry from Social Justice Warriors. Adolf Hitler’s rise to power could never have happened without control of film production, and we must take that control back from the globalists! We must ensure that Ghostbusters never wins the Hugo Award, for the fate of western civilization depends upon it! The Ghostbusters reboot must win the Hugo award. How else is the general public going to become aware of how converged the Hugo awards have become. The Ghostbusters reboot lost money and was panned by the public.